Fiveneedle Pricklyleaf is a member of the Aster Family. The plant grows to 12 inches in height and has green, cleft leaves with narrow, spiny-tipped lobes. 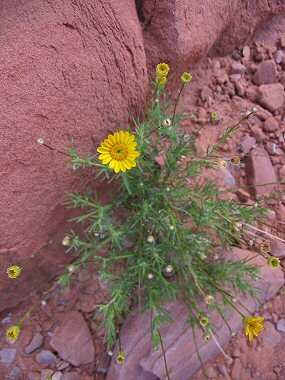 The plant typically grows along dry roadsides, gravelly slopes, washes and rocky places, often on limestone at elevations between 3000-6000 feet. Fiveneedle Pricklyleaf is attractive to bees, butterflies and birds. Fiveneedle Pricklyleaf bloom between April - November and produces a yellow rayed flower up to 1/2 inch in width.